This week it’s time for some more trap prototyping! 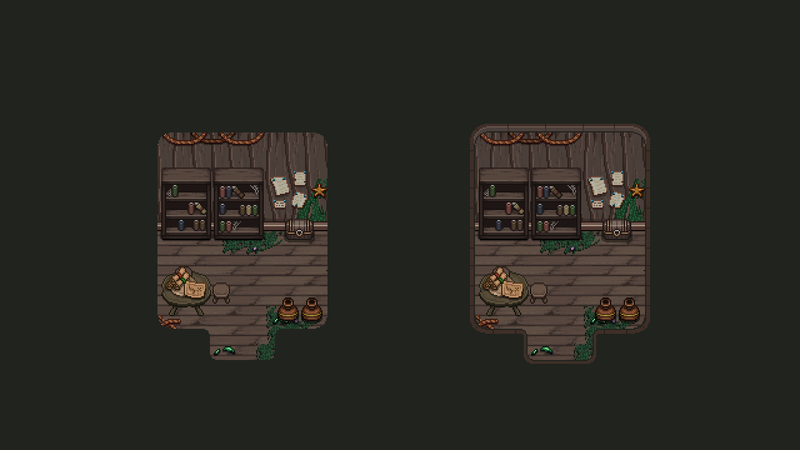 This time we’ve been working on those eyes we’re using in the ‘ghost bridge’ room, but here they serve as a ‘trap’ of sort in an ordinary fighting room. In our first iteration, we used the eye in the same way we use it in the ghost bridge room; basically moving back and forth in a set speed. If you’re in the regular world, the beam from its eye will be slightly transparent and won’t deal damage, while in the ghost world it’s darker and will damage you quite a bit if you get hit by it. For the second iteration, we wanted the eye to feel more ‘alive’, so we’ve given it a couple patterns. Either it will slowly open its eye and cast a beam straight forward, or it’ll look to the sides as in the example above for a little bit before closing up again. These patterns are then randomized so you never know which one it will do next; you’ll have to keep track of it to know how to dodge it. We do prefer the second version so far, as it makes the eye feel more like a living thing rather than something that just ‘blindly’ (ha) looks back and forth forever. It also keeps the players on their toes a bit since they need to keep track of what it will do next, rather than just dodge the eye beam over and over. And now, time for something much less exciting but still very needed… Some background masking! 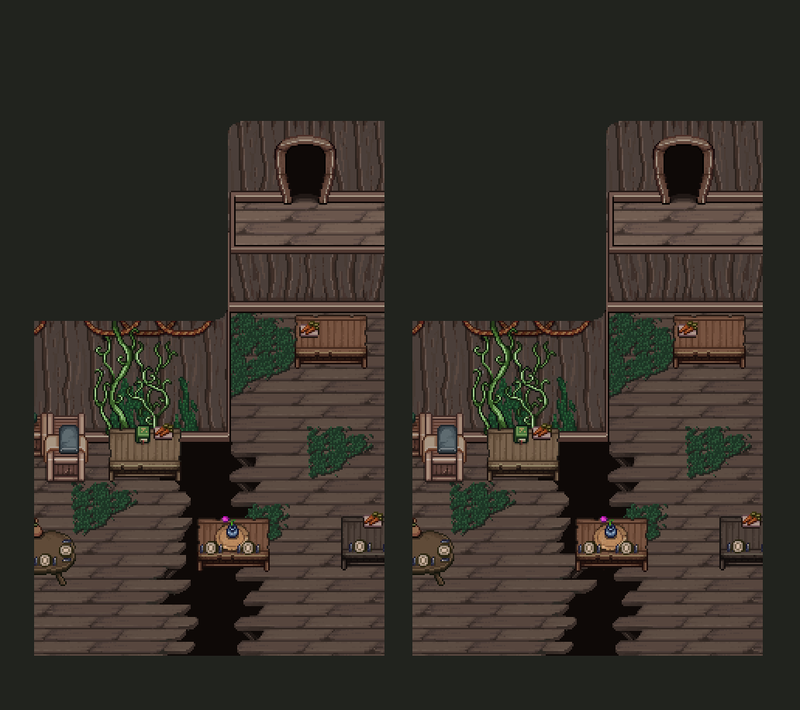 This is a technique we use when we want certain effects and such to only be visible on the floor and nowhere else. 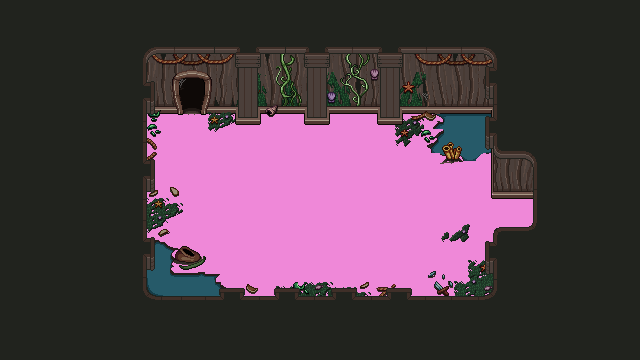 Basically, each part of the floor is painted with a color (in this case a pretty pink), which will be used as a guide in the game for where the effect can appear. Quite a few boxes! 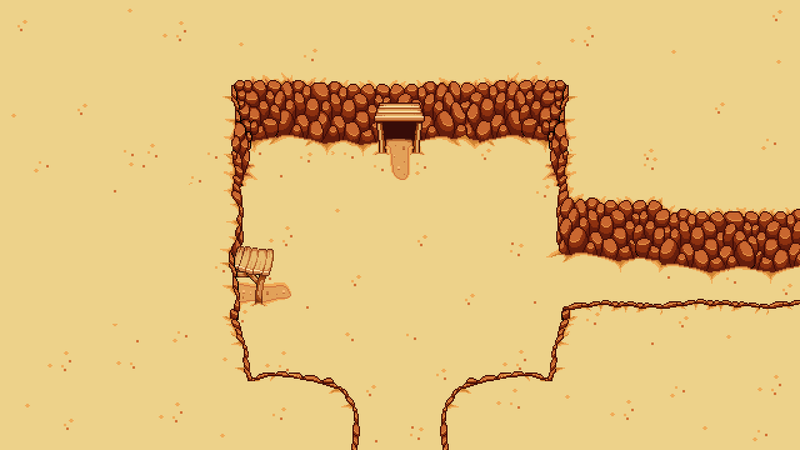 We thought of blocking the path leading straight to the door, but ended up keeping it open as we felt like forcing the player to take the long way around might feel a bit overdesigned. 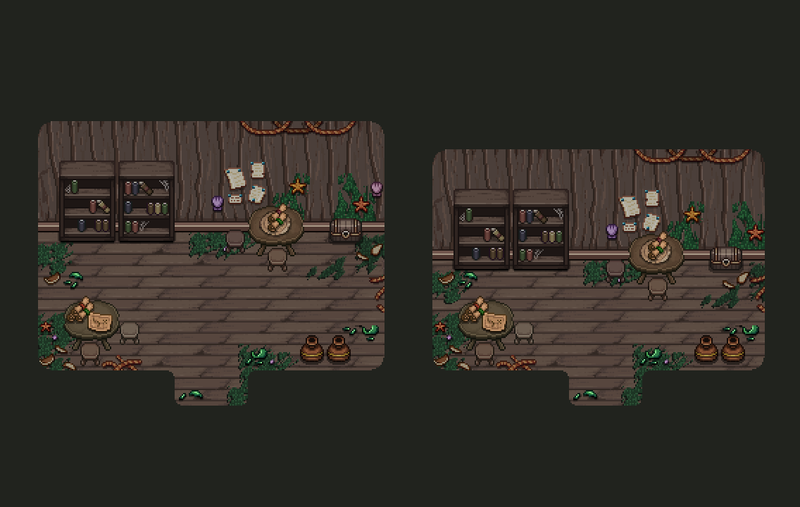 Next up, it’s time to add some of those decorations Fred were playing around with to the rooms! I’ll start by adding them to the first floor to begin with, since we want to get that floor as completed as possible before moving on. 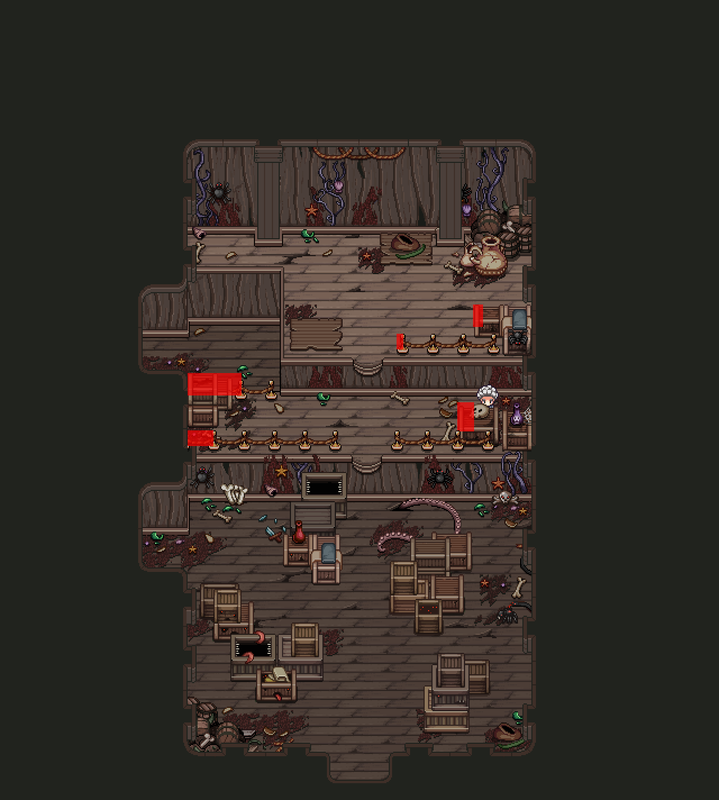 Our hope is to be able to play through the first floor in its proper form asap, so we finally can get a real feeling for what everything’s supposed to be like before moving on. 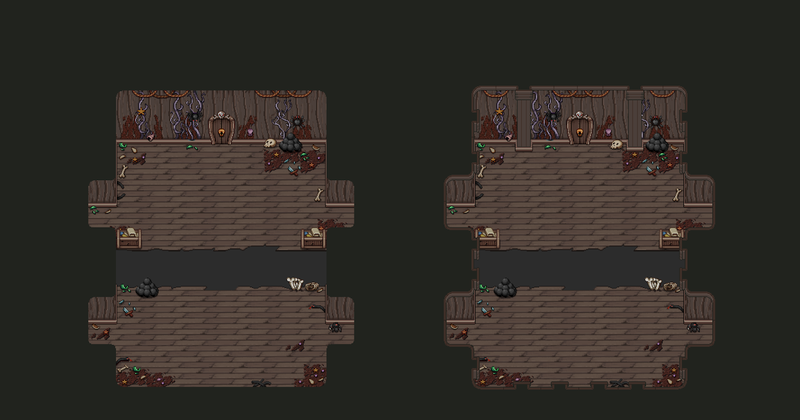 I definitely feel these decoration help with giving the ship a more… ship-y feel? And also makes quite a big difference in the detail level of each room as well. What do you guys think? Now, finally it’s time to get up close and personal with the final enemy in the ghost ship: the crabs! They’ve been ‘finished’ for quite a while, but after we tested them Teddy removed the prototype room so I couldn’t record any gifs showing ’em off! Our inspiration for these guys were pretty much the boars, straight up. Just a semi-tanky enemy that can rush in and annoy you while you’re minding your own business. 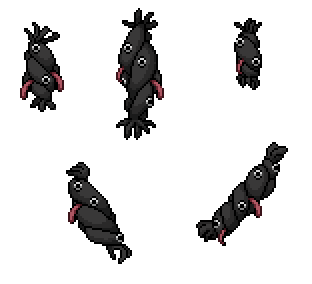 They also have some regular attacks, but if you stay too far away from them, chances are higher they will run in to mess you up, as seen above. Upon defeating them, they will fall onto their back and disappear in the usual puff of smoke! Unlike the other enemies in the ghost ship, the crabs are the only ones that work the same regardless of whether you’re in the ghost world or regular world. So, where the ghosts might become invulnerable or invisible in the regular world and gain increasingly powerful attacks in the ghost world, these guys will continue on as usual. Which one’s your favorite? I think mine’s the first, featuring the lovely bag! New week, and time to finish up the Mess hall by turning its regular version into a spirit world version! Previously these skulls were only visible in the spirit world, which meant you had to swap back into the regular world to avoid them. 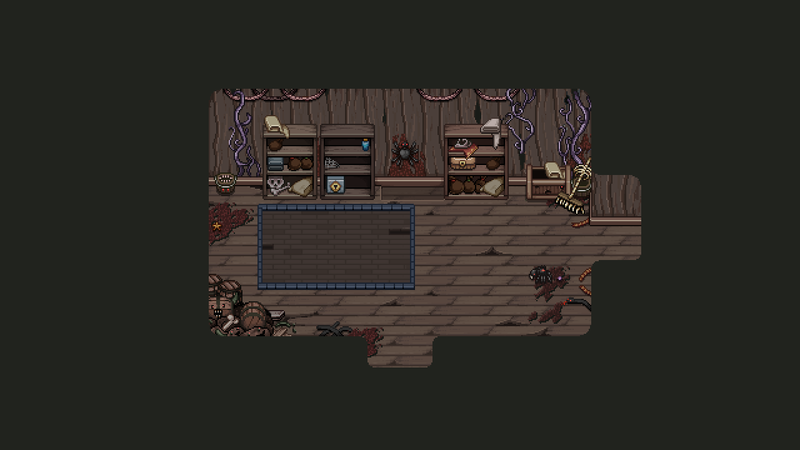 Now though, we’ve made sure some of the skulls are in the regular world as well, making avoiding them slightly harder! We still want to improve this fight slightly, but now it’s more about patterns more than anything – we’re kind of happy with what he does, just not the timings for when and in what order. In this version of the prototype seen above, he tends to randomly summon things for you to avoid, but we have since then made him go into various phases instead, meaning he’ll have a period of simply attacking followed by a period of summoning things for you to avoid. The second part will then feature both the bullet hell elements as well as dodging his regular attacks at the same time . 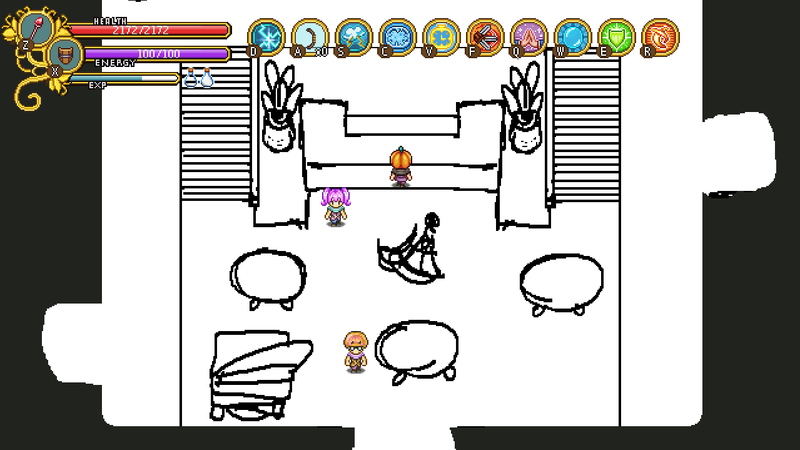 I think we’re really making progress with this and hopefully the finalized boss fight will be done soon – it definitely feels a lot closer to it now, anyway! Next on our prototyping spree, we have another of the challenge rooms in the rather strange version of Startington! In this room, you’ll be facing obsession, and it takes the shape of you killing a whole lot of slimes, which then turn into… yourself?! What could it all mean? 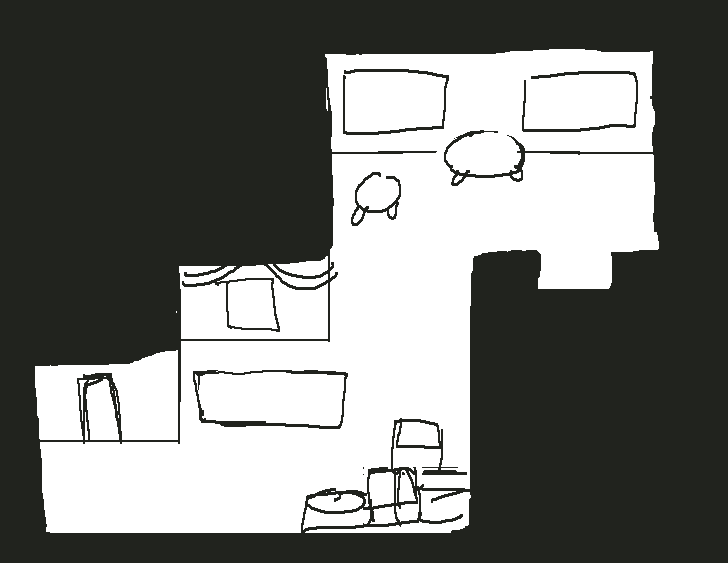 We’ll end this week with a look at a new room, though! This room is the final room of the second floor, so once this is done the whole 2nd floor can be put into the game, yay! 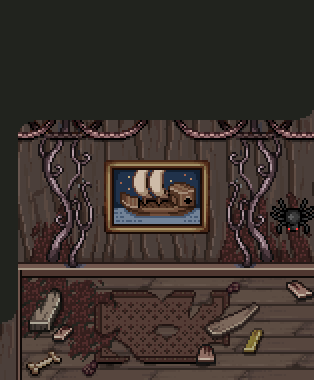 As you can tell, I’ve yet to make a painting to go inside the frame, but I’m kind of thinking I’ll make a painting of the ship itself. What do you guys think? 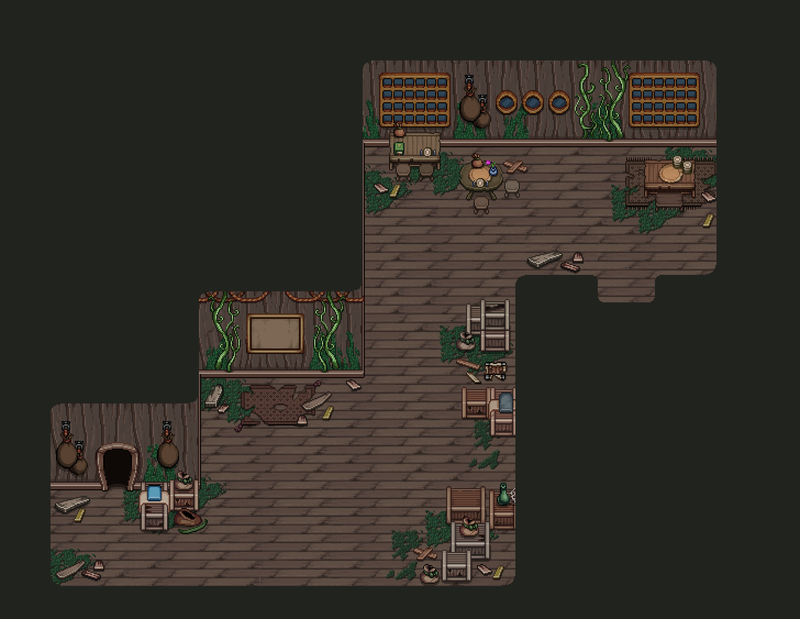 Time for the second part of the Mess hall, making all of those tables! 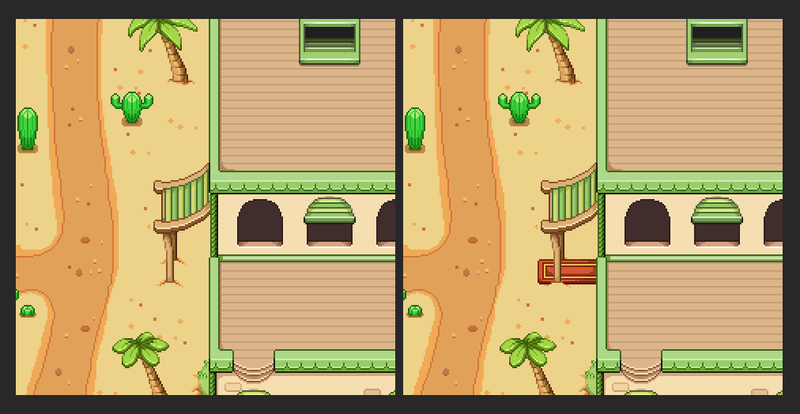 I’ll be using a bunch of old tables as a base and make them look a bit worse for wear and edit the colors around a bit. In the end, they will be decorated with stuff and ghosts will be dining by them on chairs as well, but one step at a time! 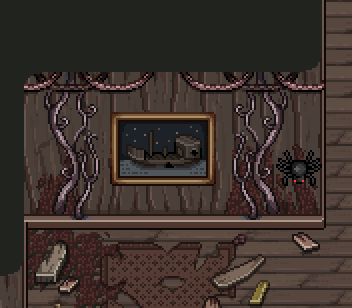 So, as you know we’ve been talking quite a bit about a strange and creepy version of Startington that you’ll visit during your stay in the ghost ship. This place will feature strange visions of things that have happened or things related to the game in a set challenges with a keyword each. The first one we’ve prototyped is for ‘expectations’, and will deal with the expectations you put on yourself and that other might have on you, and it takes the shape of a rather strange perfect guard challenge hosted by your dad! 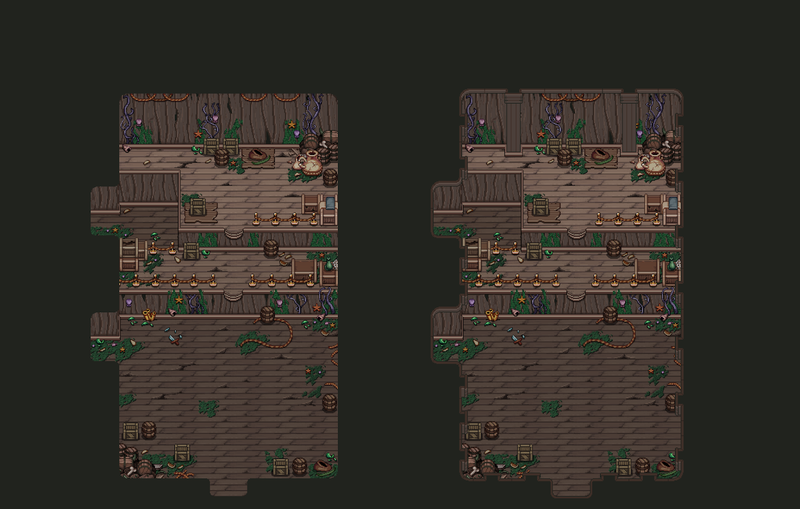 Second part of the mess hall! 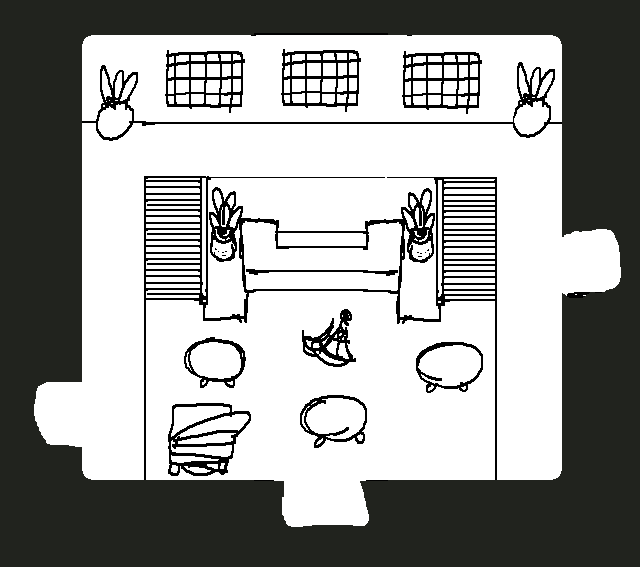 In this part we’ll be decorating the place, adding some plates and whatnot to give the room a feel of actually being a place where people might come to eat. 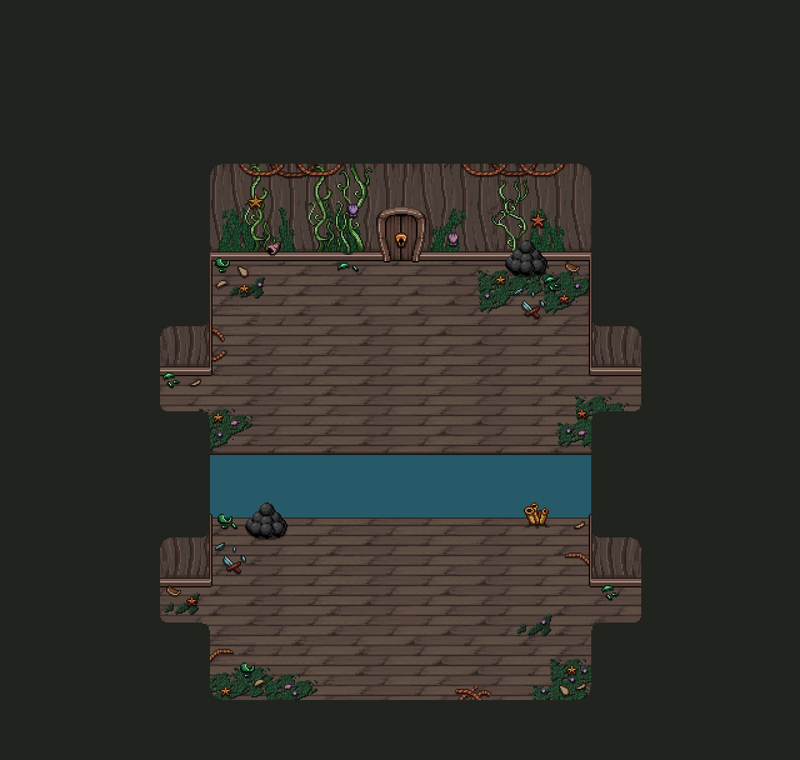 Obviously it’s gonna get a lot more detailed than this, and the water will be animated as well. 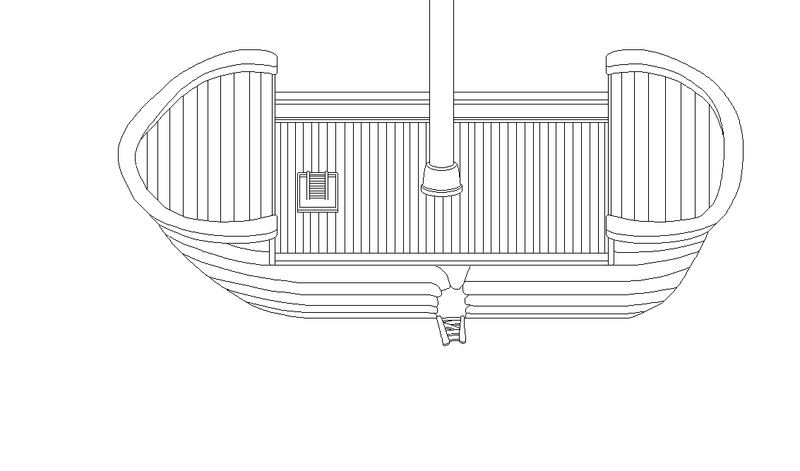 We’re also considering changing the size of the upper front and back of the boat, making them bigger since they look kind of small right now. Oh well, onwards we go! Time to take a look at what’s happening with the skeletons and discuss a piece of their design! 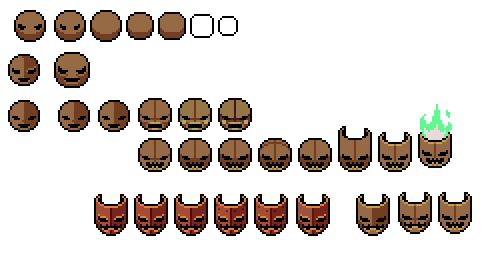 So one thing we’ve been wanting to do with our skeleton enemies is to give them a quirk where their head will fall off and become an enemy of its own, sort of like the Jumpkin from Pumpkin Woods; a pretty easy enemy that you just whack over a couple of time to get rid of, but that serves as an interesting game play element. While we do love the idea of the square head, it being a bit more original and all, we think this looks better overall. How do you guys feel? So these last bunch of days we’ve been playing around with a bunch of new puzzle ideas for the ghost ship – we really want to mix things up and get some interesting use out of these mechanics. So, first thing we’ve tried is using the spirit world mechanic to make a burning ghost light candles for you. Basically, the ghost ignores you while you’re in the regular world, and will start chasing you once you enter the spirit world, so your goal is to position yourself so that the ghost will pass over the lanterns (currently the white squares) and set them alight. Completing this task will open a door for you. If you’re too slow however, the candles will stop burning and you need to set them alight again. 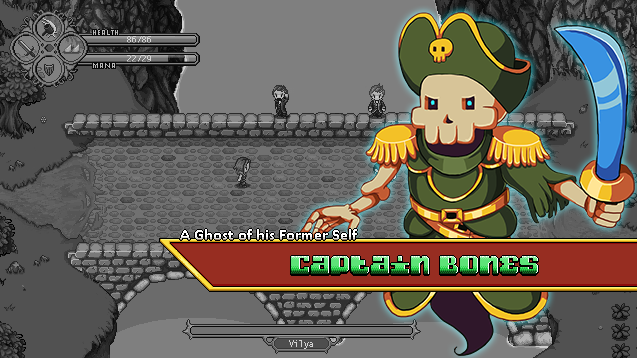 These ghosts will appear in other areas of the game as well where they will simply serve as an enemy/obstacle – you won’t be able to kill them, and as soon as you enter the spirit world they will chase you. I believe I might have mentioned them before in relation to the room with all the creepy bridges, where you’ll have to avoid them while making your way to the other end of the room. The second mechanic we’ve been playing around with has been something slightly different, yet reminding of something we’ve used before. In Tai Ming we had puzzles where you had to kill statues in the right spot, so that they pressed a button for you. In this dungeon, we’ll do something similar. 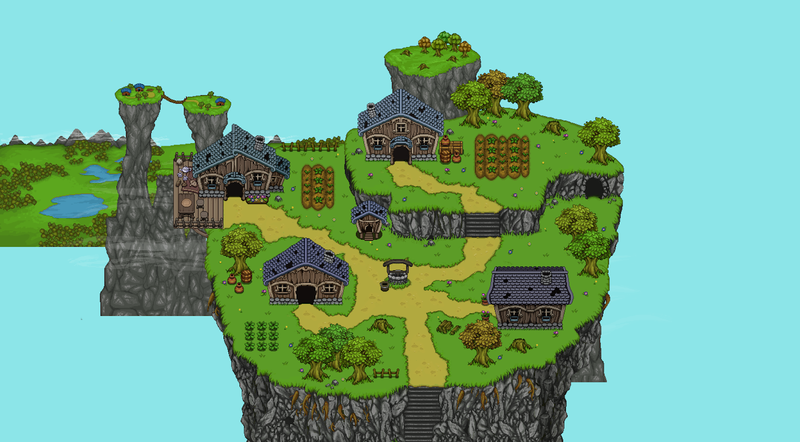 We use statues as the placeholder graphic here, but they will more likely be some kind of floating armors or some such. The idea is that these armors only live while in the spirit world, where they follow a set pattern of movement. If you go back into the normal world, they will fall to the ground and remain still. So, the trick here is to adjust the timing of their pattern by hitting them a few times, so that when you return to the regular world, they will each fall on a button if you time it right. 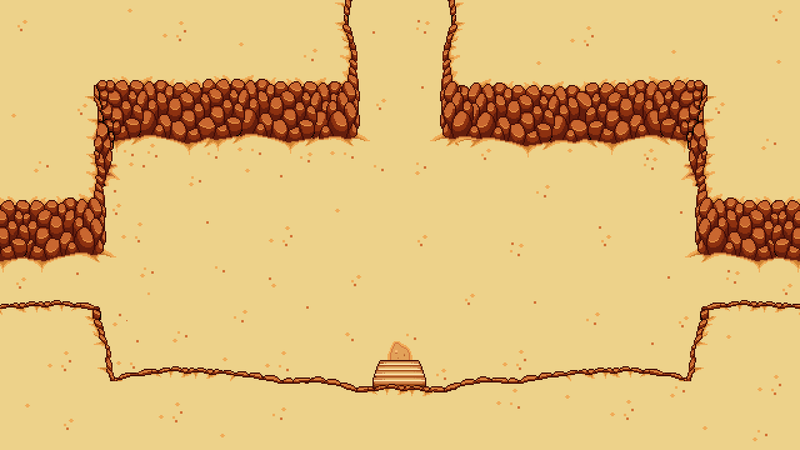 This will be a bit clunky in multiplayer, but we’ve decided on going down the path where it’s enough for one person to be in the spirit world to make them move around. In the GIF above, the adjustments are pretty slim as you hit them, but in the final version we want each hit to make a bigger difference so that you really notice something happens to their patterns when you interact with them. How do you guys feel about these new puzzle ideas? If you have any others, feel free to share! 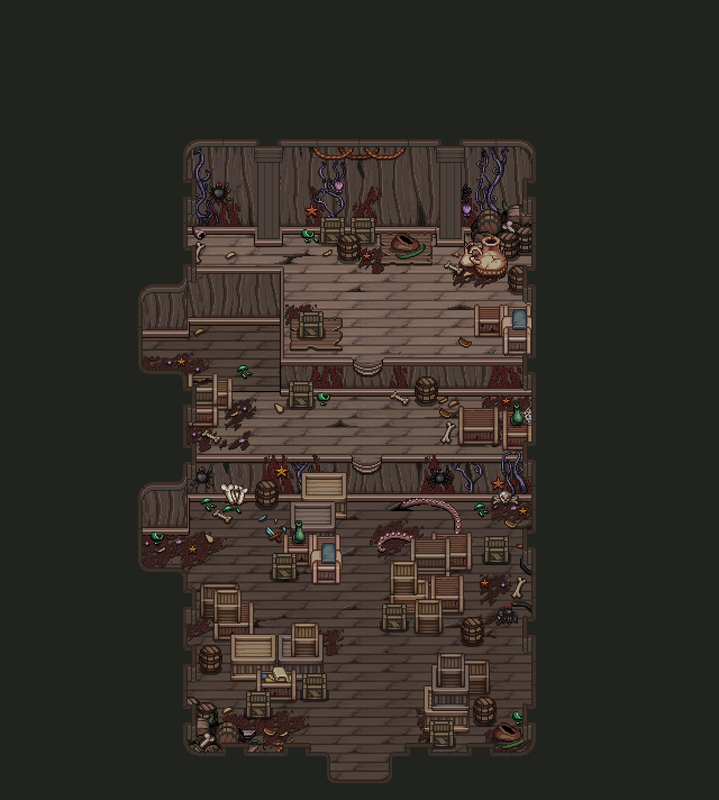 Next we’ll start making one of the remaining rooms we’ve yet to finish up; the Mess hall! We’ve showed this room a couple of times already – it’s the room with the creepy bridges. 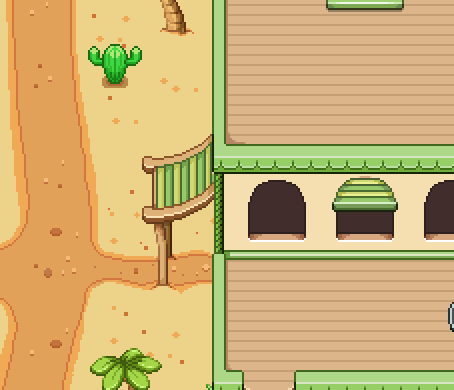 In this first part we’ll get all the basics down, the correct walls and floors as well as some basic decorations; ropes, vines, boxes and so on. 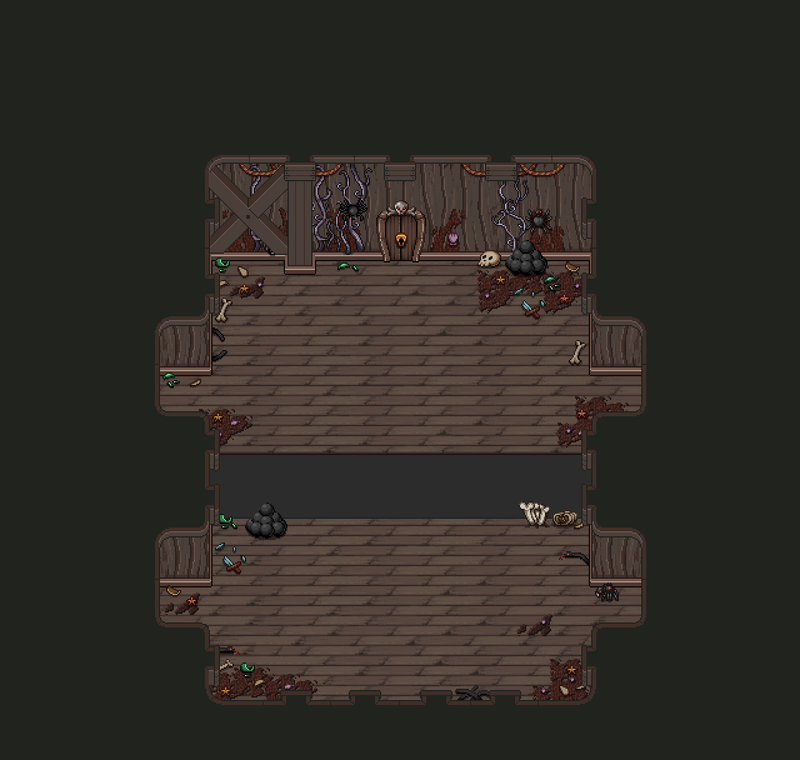 Now, with the ghost ship progressing and most rooms actually already being finished, we’ve come to realize we’ve done something different with this dungeon that we haven’t done before, and we’re not sure it’s a good thing. 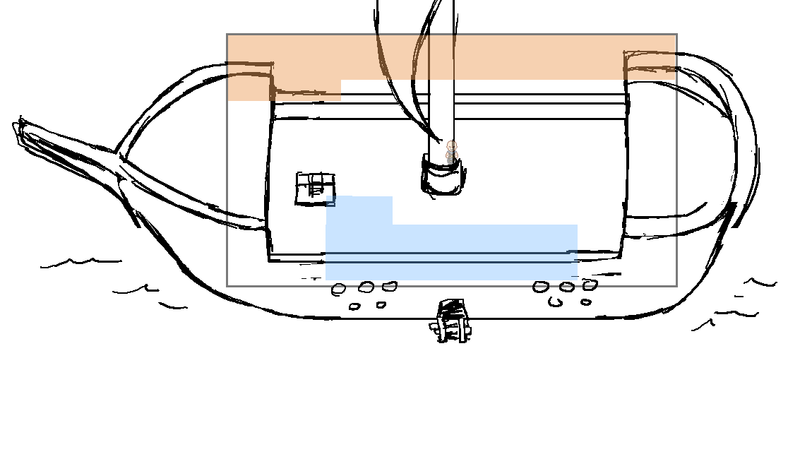 Usually we start off with sketches of every room and make sure we can run through each of them in a row, just like the dungeon would actually be, before we make the final art. 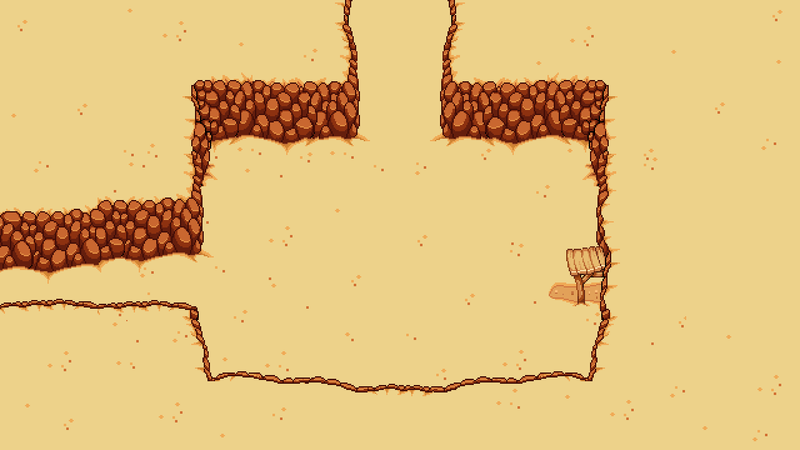 This time however, because Teddy and Fred were so busy getting the last bits of the desert completed, we decided against that and had me work on making the completed rooms first thing. 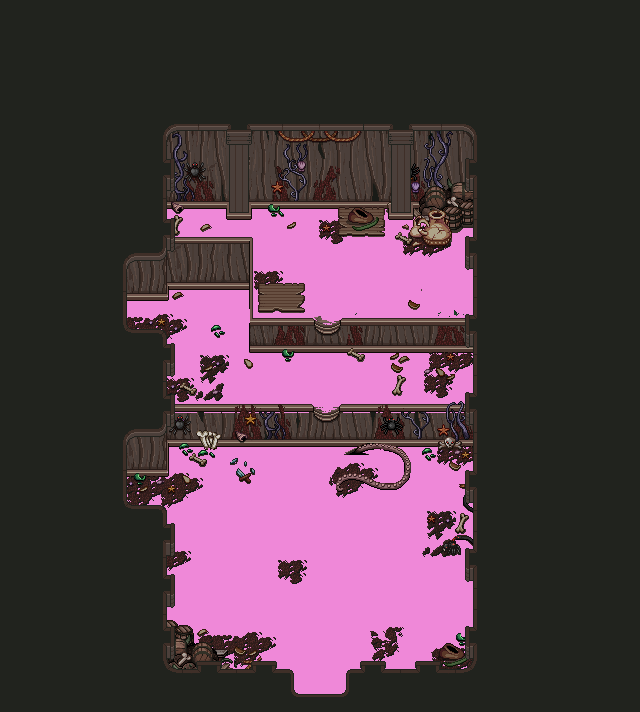 What that has lead to is that we have a lot of finished rooms, but we haven’t even had a possibility of running through the dungeon in its entirety yet as we usually do. 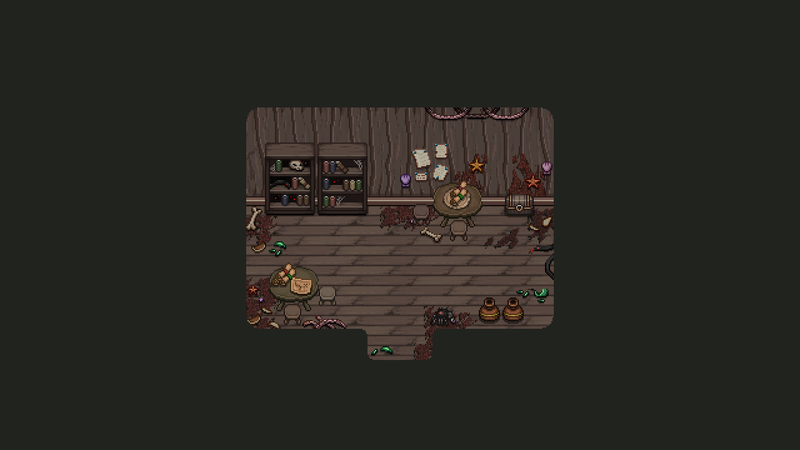 To remedy this, I’m going to take a break from the ghost ship exterior and focus on making quick sketches for the last bunch of rooms that haven’t been made yet, so that Teddy can put them all into the game and we can try it out and see what it feels like. …. and here they are! The fantastic sketches made for the remaining rooms of the ghost ship dungeon! The puzzle one is very unclear right now since we haven’t decided exactly what kind of puzzle we want in there right now. Previously we wanted it to be one of those puzzles where you get chased by something in the ghost world, as I mentioned earlier, but now we’re kind of feeling like putting in a phase shift puzzle instead – can’t have enough of those, right? The rest of the day we’ve been playing through the dungeon, each room now added by Teddy in a strange world with no colliders or enemies whatsoever, imagining what it’ll all be like when it’s finished. The short of it is that we kind of wish we had done this earlier, but alas, here we are. We got a ton of notes on things to fix now at least, which I’ll be talking about shortly. Overall though, I think it’ll be fine – it’s a bit of a strange dungeon (but then again, so was Tai Ming), but thanks to the ghost world mechanic and the enemies I think it’ll be interesting. 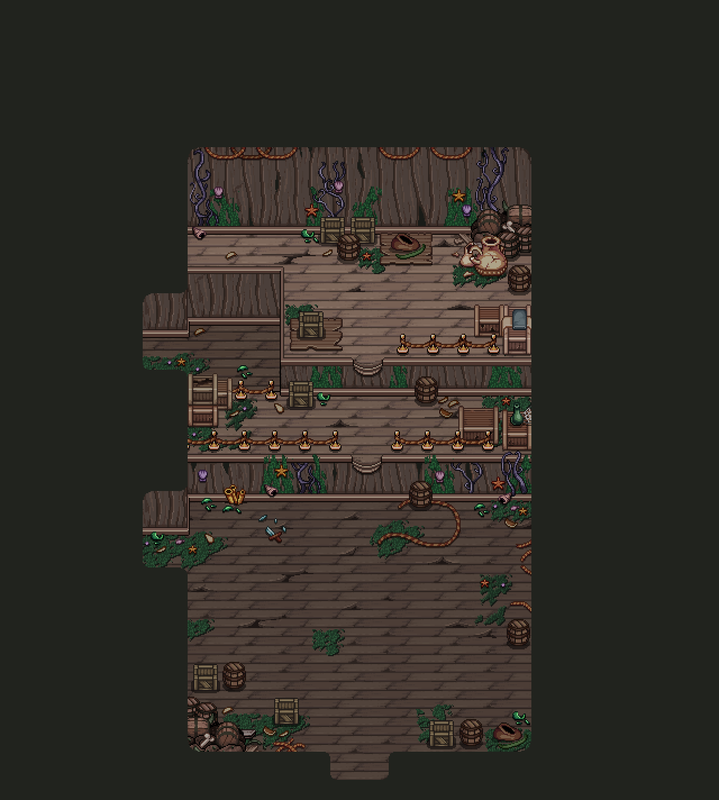 So the first thing we decided to change when running through the dungeon was the size of the first room – always amazing when your first big change is in the first place you see, right? We felt this room was a bit small and didn’t give the proper introduction to the ship as a big and creepy place the way it should. 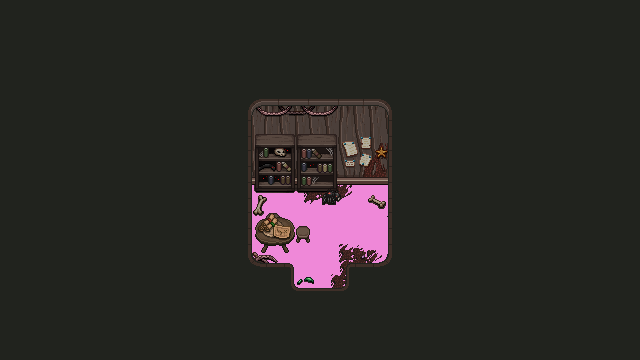 Same thing with one of the rooms on the third floor – previously we’ve been making a lot of too large rooms so I started making them a lot smaller since I always overestimated the sizes. Turns out I’ve gone too far the other way not instead, haha! 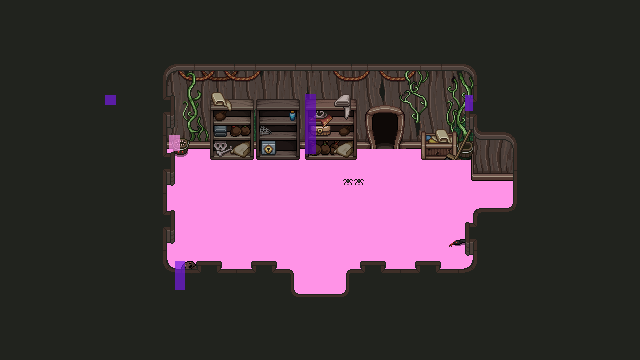 Oh well, for this room it will be an easy fix since it hasn’t even been properly made yet. Next, there’s a room where we thought we’d have some sort of bullet hell thing going on, but we’ve decided to change that for two reasons: one being that the boss already has a lot of bullet hell elements, and second, the room would be a nice opportunity to embrace the creepiness factor of the world instead. So, instead of an exciting bullet hell, there will be some creepy examining things in an abandoned ghastly kitchen, trying to figure out where a lost key is. 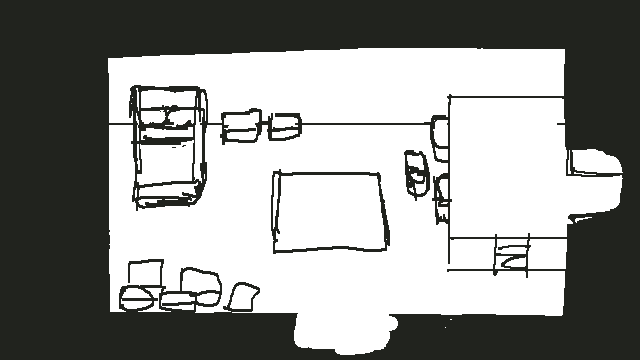 Other than that, there have mostly been minor edits and changes to make, such as more details in some rooms and added features in others, like a bookcase that will fire books at you, and possibly an encounter with a possessed refrigerator and oven – it depends on how further testing goes. 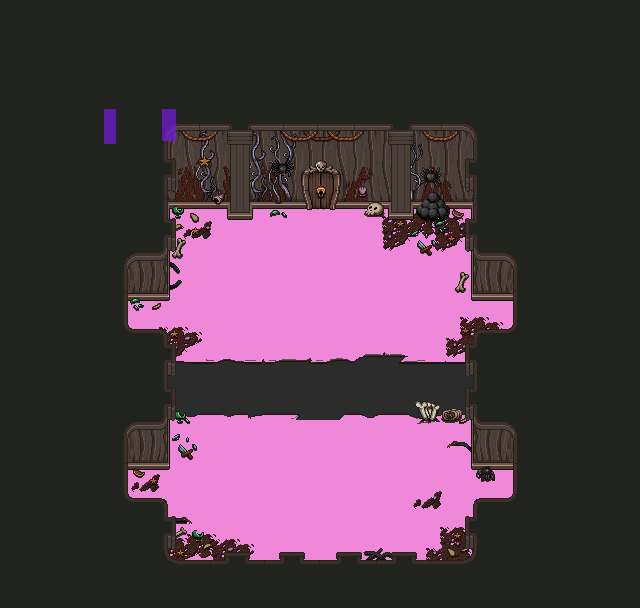 This whole dungeon is pretty strange right now as it’s very finished but also very unfinished, many of the rooms are ready but the encounters and puzzles are not. 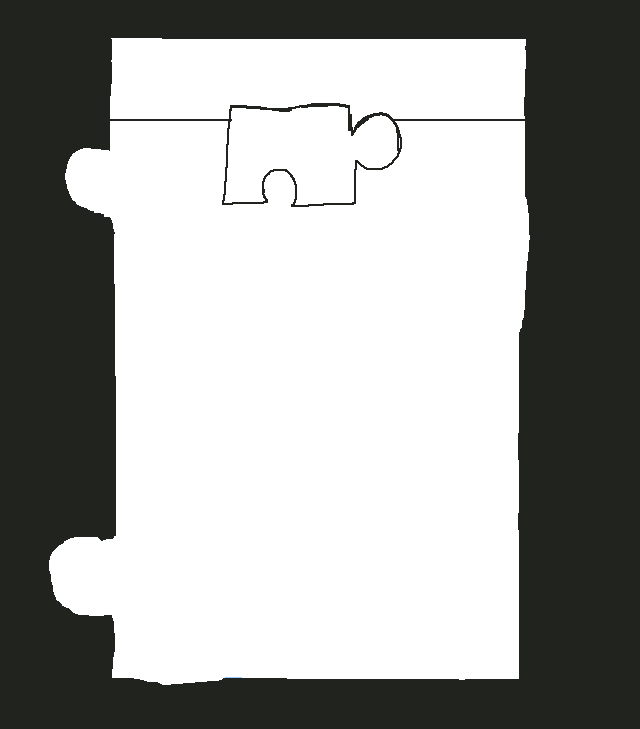 It’s possible we may need to redesign some parts if the puzzles we want to make don’t work out, but we’ll see! Needless to say, right now we’re doing a lot of discussing and testing back and forth, so we’ll see where things end up when all is said and done. So cute! I personally think this might be the cutest enemy of the game. Who agrees with me?! 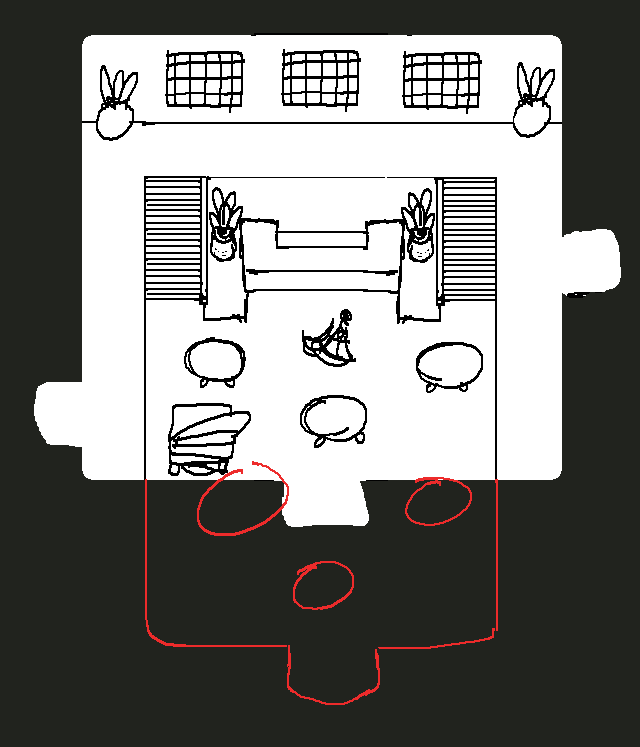 Once everything else is in place, Fred will likely add some moving things to these rooms as well, for the bonus creepiness factor. It’s not visible right now but our idea is that the ship will be surrounded by some trash and debris like ropes, nets and plants, and you’ll walk over on them into the ship through a hole in the hull. When you first get there, we’ll pan the camera over the top of the ship to show you what it looks like, and who might be waiting on the deck but…. Yeah, that’s right, Luke! As a lot of you have figured out already, you will definitely be battling Luke here, so getting the size of the deck right is pretty important as there will be a fight going on. 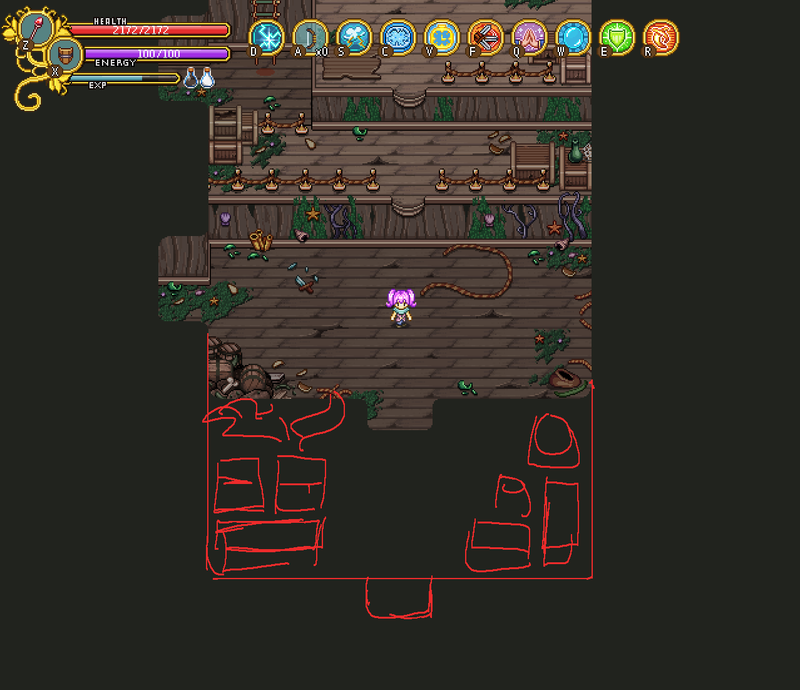 In this first sketch though, we’ve made the ship a little bit smaller than we’d like, but it’s a good place to start. 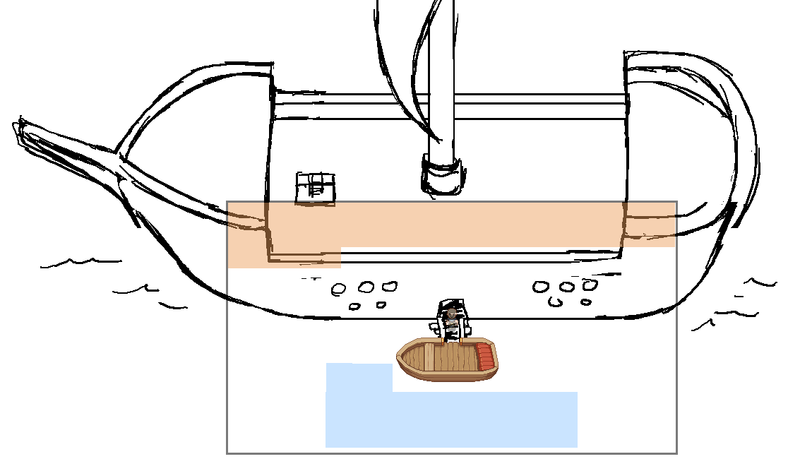 In the above screen you can see another placeholder camera for what the boss fight screen would be like, but again, we’ll probably make the ship bigger and seal off the fight area instead – we’ll see! As you can see, we haven’t added anything cool the the bow of the ship yet; we’ll see whether you’ll actually even ever see that part of the ship ingame or not; might be that you won’t and then it’s pretty pointless to spent a bunch of time decorating something nobody will see! 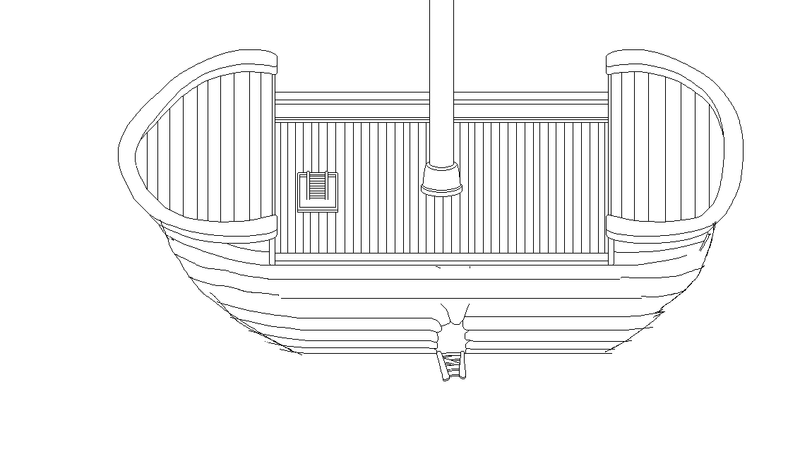 As I mentioned before, we’ll make the ship bigger as well, but for now we’ll start with this basic lineart and start editing it to fit our needs in the next step. If these eyes see you in the ghost world, you’ll immediately take a whole bunch of damage and get frozen in place, so you better go back and forth between the spirit world and the regular world to avoid them!